Tenergy 05 is an ideal rubber for offensive topspin strategic play. Tenergy series features the integration of modern innovation, “Spring Sponge” and well-known “High Tension” technology which is well designed for a replacement of speed-glue. The rubber is perfect for a modern table tennis strategy which enhancing lots of feels, spin variations, and fierce dynamics. Tenergy 05 is the first product of the Tenergy series feature with the shape of the original pimples. It combined High Tension technology with the characteristics of a highly tacky rubber to maximize spin power. Its great performance has not only been proven by a large number of professional players but also in scientific measurement. It is one of the best spinning rubbers being produced by Butterfly. If you are looking for this rubber, you can get it from Megaspin. This rubber has been long regarded as one of the best modern offensive table tennis rubbers in the market with a very expensive price (USD$ 70 – 80). Its popularity has been proven by tons of solid professional players year after year. Physically the rubber is quite heavy with nearly 50 g (lighter than Tenergy 25 but slightly heavier than Tenergy 64 and 80). It offers a medium to hard feelings with the new High Tension technology from Butterfly that optimizes its spin and speed. In terms of serve, Butterfly Tenergy 05 offers quite decent side-backspin power. Even though this is a non-tacky rubber, you can still perform heavy backspin with little effort. Given the fact that the rubbers offer you many gears, it allows you to perform a nice variation of speed and spin for your serves. In addition, this rubber is quite a forgiving rubber for serves which means it allows you to make a fine serve despite some slight mistakes. Regarding speed, Butterfly Tenergy 05 features extremely fast speed. Its speed power is close to the fastest rubber in the market (slightly slower than Butterfly Tenergy 80, and Butterfly Bryce Speed FX). It allows you to perform a very strong punch or smash with almost effortless. It sounds like a rumble of thunder when the rubber hit on the ball. Spin power seems to be a prominent feature of this rubber. Butterfly Tenergy 05 offers you monstrous topspin ball with relatively high throw angle (higher arc than Butterfly Tenergy 80). Its spin power is arguably more powerful than Tenergy 80 and slightly less than Butterfly Spin Art. This rubber is not only provided tremendous spin power but also help you to generate spin relatively easy with almost effortless. It is a very forgiving rubber that allows you to generate decent topspin loop even with some inconsistent strokes or techniques especially when integrated with good control blade. So this seems to be ideal for intermediate players to practice their loop. In terms of controllability, Butterfly Tenergy 05 offers a reasonably fine control (slightly better than Tenergy 80). It allows you to return the ball with high precision for both direction and distance. Blocking ability is second to none among offensive blades. Furthermore, this rubber provides the ability to reduce the sensitivity of incoming spin ball (Thanks to the conical shape of the pips). This will greatly enhance controllability. Overall, this blade features a very impressive mix between speed and spin. It is arguably one of the best offensive rubbers for the modern table tennis. Only one con is its expensive price. It is highly recommended for intermediate to professional players who come with a high budget. Offensive: Butterfly Jun Mizutani, Butterfly Michael Maze, Butterfly Sardius, Nittaku Tenor, Butterfly Timo Boll ALC blade. Butterfly Tenergy 2.1 is the fastest, spinnies and most control for a looping. Tenergy 1.9 is in between. 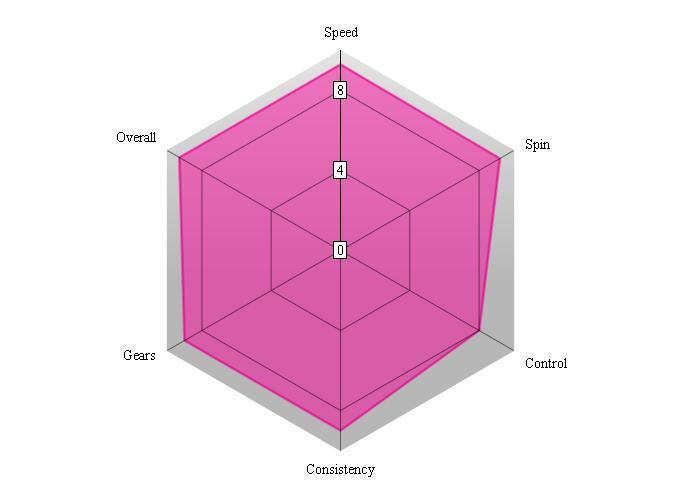 Tenergy 1.7 is the slowest, least spinny and has the most control for less aggressive play. You can loop with any thickness, it depends on your blade too. The thinner you go through, expect that you need more precision when you go for a big swing because you have less rubber to work with. Tenergy 1.7 is quicker but not more powerful. You have less catapult but the ball hits the blade quicker and leaves quicker too and encourages a more drive style which can be very fast. If you are a serious looper and want to experience the true Butterfly ratings that they advertise to make sure you use the 2.1 as most professionals who use Tenergy use 2.1, and Butterfly most probably does its test primarily at maximum thickness. 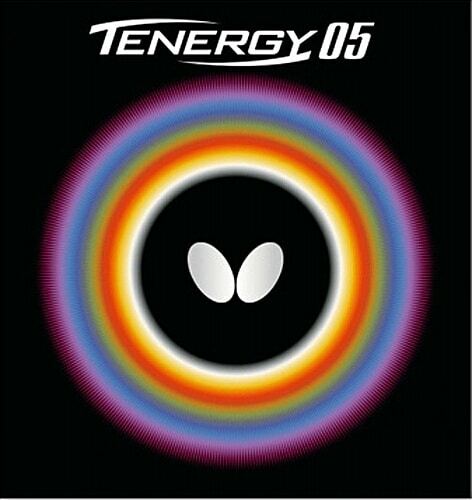 When Butterfly first released the Tenergy 05 in FX version, it created a buzz in the ping pong community especially those who have already used Tenergy 05 were crazy in buying it. The FX version is lighter than the original 05. Although Tenergy 05 has a medium hard sponge, it didn’t suit for many people who love to have the ball penetrating into the blade easily. The FX version makes more sound when hitting the wood. Like every softer product, Tenergy 05 FX is less durable compared to 05. FX feel better on softer blades which allow more natural progression. So if you have a Timo Boll ZLF, you should keep it as the blade is made for the FX versions. Is Tenergy 05 really that expensive considering the outstanding performance and durability that it can offer you? Well, although the price is high, it is well worth the money. You just need to make sure that you are taking good care of it and it will last for a long time. The rubber has often been referred to a separate category or even a middle category between Chinese spin and Euro speed rubbers. Tenergy 05 is not as tacky as the Chinese rubber but it produces more spin than the Chinese rubber. The high speed and sponge for mechanical spin put it closer to European ping pong rubbers. So you get some advantages of traditional Chinese tacky rubbers (easy spin on serves and loops), but with great blocking and driving ability. The rubber can perform the offensive style very well. it is like a Euro and Chinese rubber being fused together. Butterfly Tenergy 05 is already optimized to be the best looping rubber available. Even the smell of the rubber seems to have a bit of a boosted type of odor. To touch a new sponge, I always have a slight kind wet chemical which tends to dry the skin a little bit. There is for sure some residue already on the sponge. What happens when you speed glue even older generation rubbers is that you lose the consistent same playing quality of the rubber. Boosting Tenergy creates a similar problem. If you make the sponge too moist, the sponge can become “gluggy” like a marshmallow, which may improve spin but create unpredictable softness which in turn will not improve your game. I have experienced the ball dipping into the net much too early. The softening up of the sponge sometimes creates so much spin on the ball that even near the table when you go to loop it doesn’t loop at the right length. Instead, the ball just spins straight into the net. I am scared that Tenergy FX might play more like this. The medium hard sponge that Butterfly Tenergy comes in is what gives perfect consistency in looping. The best thing about boosting or speed gluing Tenergy just slightly is making the top sheet just that little more elastic. The top sheet becomes softer too eventually, and this means it catches and spins the ball even better. The problem with this is that it becomes even more fragile and easy to rip, tear or crumble. All I am going to say is I am through with trying new rubbers. I have never found anything that plays like the original Tenergy 05 on my forehand or backhand and only could bring myself to use Tenergy 64 on backhand instead. I have spent or should say wasted so much money trying other rubbers looking for cheap alternatives and have finally decided my search is fruitless. I am stuck in a bad place now since I wanted to eventually boycott the price rise but find I just can’t play as well with anything else. Tenergy 05 on my forehand gives me the confidence more than any other rubber that I can counter-attack a ball because it plays so consistently. Tenergy 64 on backhand gives me the confidence both away and over the table in the same way. Tenergy 64 with just mild forward over the ball loop right off the bounce can almost counter loop any incoming shot from a big attack and super spin. I am resigning from reviewing new stuff and sticking to know what plays best the way I play best. My current 05 and 64 is about 5 months old and plays better than anything else new. We’ve talked about table tennis Tenergy rubbers for various levels elsewhere but it would seem that most of us will fall into the intermediate player band. As a result, table tennis players who are out of the basement and yet not in the top group wonder where they are in terms which rubber they should use. I would say if you don’t feel you are going to win with looping and making them block off the table then don’t expect a rubber do it for you. If your style is to spin up and make them miss because of spin then Tenergy 05 will be a nice rubber to learn to get used to. But if you are not willing to put in the hours stay away from 05 and probably the rest of them. Tenergy 05 FX might be more normal for some but I would say to use something you can just hit the ball around with such as Sriver FX (if you love butterfly) or go to some less spoken of company like Joola and try out their forgotten offerings like “Topspin” which is like Palio Thors almost. A tacky Euro rubber full of grip Euro style producing huge spin on a harder sponge. Don’t believe the hype the old stuff is often as good as the new stuff just slightly different. You will not need the best looping rubber Tenergy – if you will not do the stroke. For lower than intermediate if you like hard there are numerous rubbers such as Spring Thunder Palio Hadou biotech and they are only a year old in the technology of rubber making if that means anything since nobody has come close to Tenergy. If you chop you could use almost any deader rubber (dead = good in this situation).